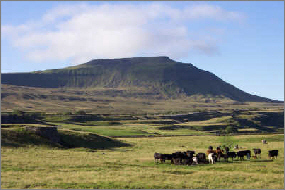 Ingleborough stands at 723 metres. On its rock strewn summit you can still make out the remains of an ancient Iron age fortification constructed by the British north-western tribe, the Brigantes. It was probably built during the first century AD when under attack from the Romans who were determined to subject the area to their rule. Around the top of the summit which is nearly a mile in circumference the Brigantes built a 3000 ft long stone rampart out of millstone grit, which has now collapsed. The surface limestone offers one of the best examples of upland limestone pavements in the UK. 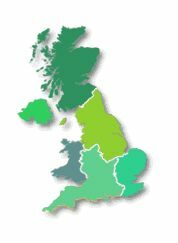 From the summit there are fine views back to Whernside, and on a clear day it is possible to see the Irish Sea, the Isle of Man to the west, and continuing in a clockwise direction Morecambe and on to the lake district with the Langdale peaks, Helvellyn, Skiddaw, and Scafell Pike. 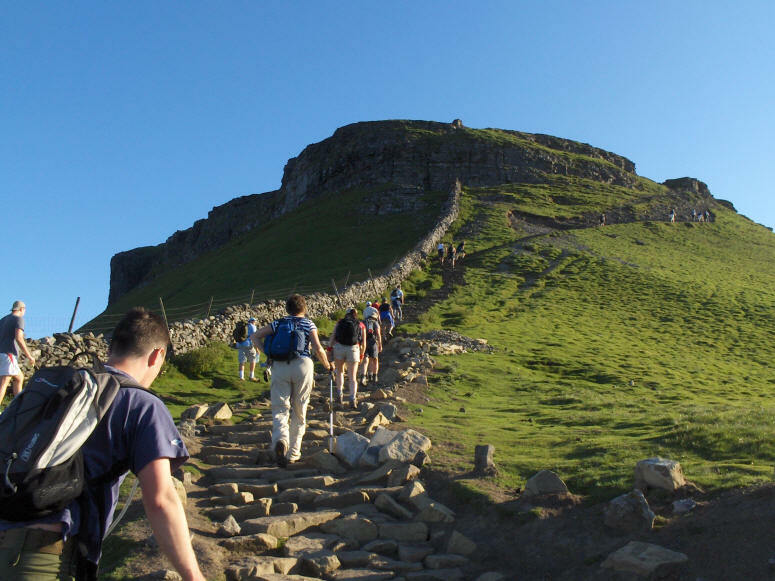 At 694 metres Pen-y-ghent is the lowest of the three peaks, although the steep scramble to the granite clad summit leaves a lot of walkers believing it to be the most demanding. The three broad bare rakes of Pen-y-ghent on it’s western face are it’s most famous feature and were shaped during a thunderstorm in 1881. 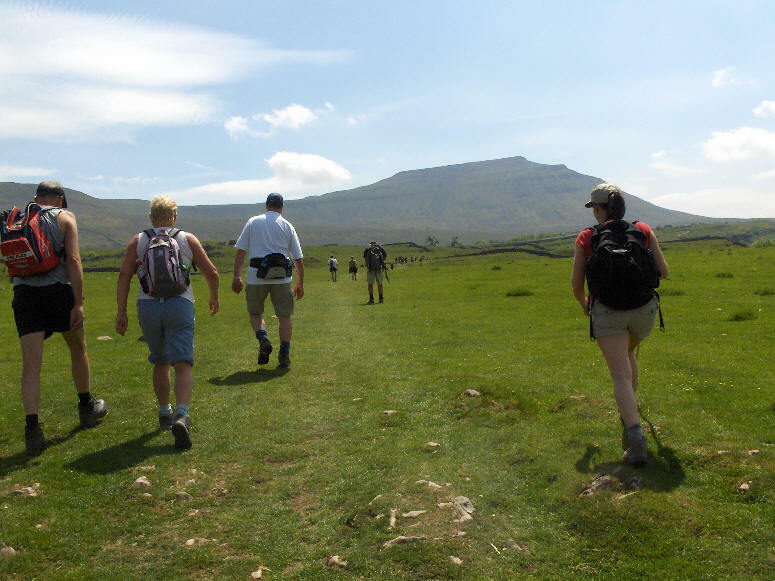 Taking in the marvelous views across to Darnbrook and Fountains Fells to the east and Ingleborough to the west is a great excuse for getting your breath back after the demanding pull to the top. At 736 metres Whernside is the highest of the three peaks, and is often termed the ‘roof’ of Yorkshire. It’s long shallower slopes host a number of tributaries of Little Dale Beck and Winterscales Beck. Although a long slog, the ascent via Force Gill isn’t particularly difficult, unlike the severe descent which is guaranteed to get the knees cracking. 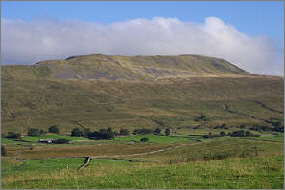 Both Pen-y-ghent and Ingleborough can also be easily seen to the east and south, and the fine views over Dentdale and back down Ribblesdale more than compensate for the energy spent in ascending this peak. Whernside is an ideal vantage point to view not only the other peaks but the trains that pass over the Ribblehead Viaduct. 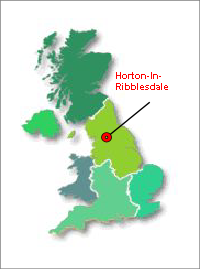 The Three Peaks walk starts in the tiny village of Horton-in-Ribblesdale, near Settle in North Yorkshire. 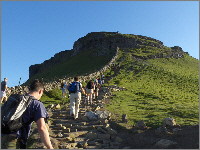 Just across the road from the cafe is a small track which leads into a steep climb to the daunting peak of Pen-y-ghent (694m). The Cafe is a family business, run by the Bayes family who have owned it for 37 years. Peter Bayes was looking to leave his job and take on a business in the countryside for the sake of his children. Between 1968 and 2000 more than 200,000 walkers who clocked in at the cafe made it back within the target time of 12 hours. 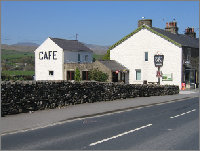 One of the popular visitor spots in Horton-In Ribblesdale is the Pen-y-ghent Cafe which is a starting point for many three peaks walkers. 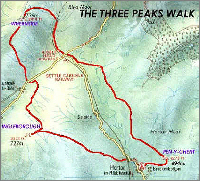 The Three Peaks area covers about 160 square kilometres of upland and incorporates the peaks of Whernside, Ingleborough and Pen-y-ghent in the Yorkshire Dales, all of which are around 700 metres high. They are probably the most popular outdoor areas in the Yorkshire Dales National Park due to the wild landscape, the limestone features, and the hill walking potential. 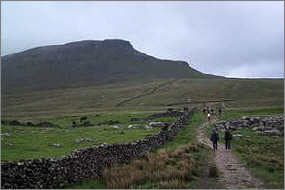 As many as 120,000 people climb Ingleborough each year. Ribblehead, at the top of Ribblesdale, is in the centre of the Three Peaks and is itself famous for the Ribblehead Viaduct where the Settle-Carlisle Railway crosses the boggy moor. many tunnels, viaducts and bridges, and cost many lives. 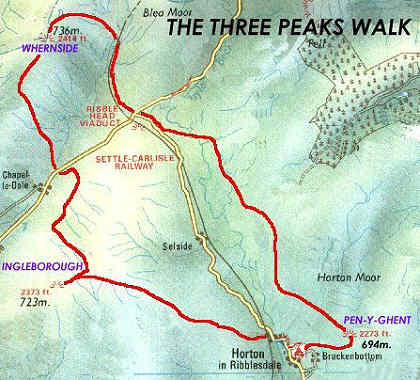 The ascent of Whernside is tackled from the Ribblehead area. Further down the dale, Horton in Ribblesdale is a stopping off point for Pennine Way walkers and for the ascent of Pen-y-ghent. Dominated by its limestone quarry, it is a useful base for exploring upper Ribblesdale.